Salt Lake City-based headwear manufacturer announces brand partnership with Mark Miller Subaru. Discrete and Mark Miller Subaru, two staple Salt Lake City brands, are partnering to take advantage of the energy between their brands in the greater Salt Lake City market. 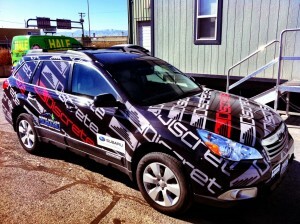 Discrete will utilize its customized Outback all-weather vehicle with both Mark Miller and Discrete branding, bringing great presence for both brands in the greater Salt Lake City area. Julian Carr, owner and founder of Discrete approached Mark Miller with the concept. “Mark Miller and Discrete have a win-win situation on our hands, we both speak to the same consumer: young adults who love the outdoors, we’re helping each other gain exposure to the right people, a marketing idea we’re both very happy to pursue. This partnership will have great synergy between our brands.” he said. Throughout the 11/12 winter season and beyond, Discrete will showcase the collaboration vehicle at industry events, movie premieres, competitions, online via social media & Discrete TV web series, print opportunities, front row at all major Utah resorts, and more. Mark Miller Subaru has been selling and servicing new and used Subaru vehicles since 1971. With two locations at 3535 South State Street in Salt Lake City and 10920 South State Street in Sandy, they are able to provide great customer service for the entire Wasatch Front. Visit http://www.markmillersubaru.com to view their inventory, see their specials, order a part or schedule a service appointment. Discrete Sport, LLC is the only true rider conceived, rider owned, rider operated headwear company in the ski industry. Established in 2006, Discrete is a collaboration of athletes, designers, musicians, artists, and photographers. The company’s international office is located in Salt Lake City, Utah with distribution in the United States, Norway, Canada, Sweden, and South Korea.